As 26th President of the USA, Teddy Roosevelt said, “In any moment of decision, the best thing you can do is the right thing…the worst thing you can do is nothing.” Last month - where we set course for the rest of 2018 with our strongest views - one of our decisions was to continue to favour international equities over domestic equities. This month, we delve deeper into why we hold this view. We highlight the greater opportunities that international equity markets can offer, from more exposure to faster-growing sectors (such as technology and healthcare), to stronger earnings expectations and less demanding valuations. We also discuss some recently updated long-term return expectations that have moved in favour of offshore equities (relative to domestic equities). This suggests this near-term tactical tilt may evolve into a more strategic position when we undertake our two-yearly portfolio review later this year. But first, this month we are making some tactical asset allocation changes. These are consistent with our views enunciated last month. They strengthen our medium-term desire to be less exposed to fixed income as the US Federal Reserve (Fed) steadily raises rates, while adding greater weight to alternative assets at this later stage of the cycle. Importantly, we also factor in some of the risks canvassed last month - increasing US growth leadership and a loss of growth momentum in Europe - into our equity allocations. We are moving modestly overweight US equities and further underweight both Australia (post its recent stellar run) and the UK (as policy risks re-surface). While still neutral equities overall, this spreads our international overweight across Europe and the US, and more clearly favours the US over emerging markets. This is, indeed, a shorter-term tactical call, capturing what we expect will be a strong 3-6 month period for US growth and earnings. As we have noted previously, we still expect to be facing another decision by the end of this year, being whether to close our overweight to international equities. Australia is a key pillar of our portfolios. Not only do our investors’ liabilities sit here, but the market also offers a relatively attractive yield and franking system. Yet, there are three reasons why we are tactically underweight Australia relative to the rest of the world at this point of the cycle. 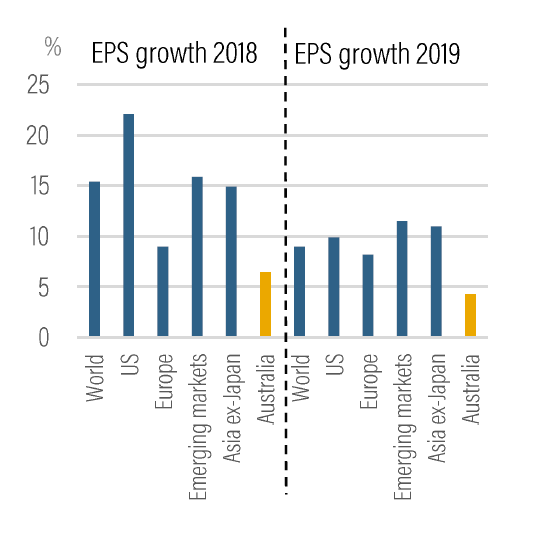 According to UBS, consensus earnings per share (EPS) growth for Australia is 4.2% for calendar year 2019. As shown in the chart below, this is around half the pace of earnings expected in other key markets, such as the US (9.9%), Europe (8.2%) and Asia ex-Japan (11.1%). Looking at 12-month forward price-earnings ratios (PE), Australia at 15.7 times is slightly more expensive than the world (15.4), while Europe (13.8) is more attractive than the US (16.1). In Australia’s favour, recent 2018 EPS revision momentum over the past three months is positive (+0.7%), and much stronger than for Europe (-2.8%) or emerging markets (-3.7%). The US, however, is the standout (+2.1%). “the simple reason for Australia’s underperformance in 2017 is that the Australian equity market is heavily overweight banks and heavily underweight tech”. The banking sector has ‘served Australia well’ for many years. However, bank performance has dragged on the local market, while the sector also faces a potential secular downshift in future growth as structural credit tightening unfolds in the wake of Australia’s banking Royal Commission. For example, in 2017, Australia’s local banking sector delivered 2.1% total return, not only underperforming the domestic market, but also underperforming the global banking sector (+17%). The other key headwind for the Australian market is its very low technology weighting, which has also dragged on relative performance. At just over 2%, Australia’s opportunity in technology compares poorly to other regions, such as the US (at 24%) and Asia ex-Japan (at 32%). Healthcare is another fast growth sector where the local weight (8.6%) is well below the world (12.2%). Technology continues to be the strongest performing sector globally by a significant margin. While this makes it vulnerable at some stage to a correction, valuations appear reasonable, given little sign of a plateauing in earnings growth. Of course, technology’s performance still argues for greater selectivity when establishing new money technology positions. Australia’s heavy weight in slower growing sectors presents a headwind to market performance. 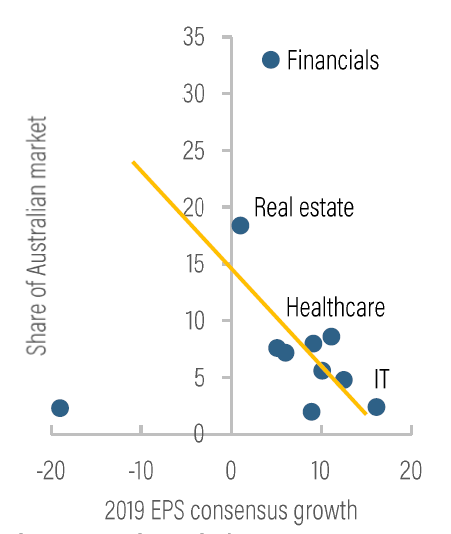 As shown in the scatter plots below, Australia’s higher sector weightings (such as banks and real estate) are those sectors with slower growing earnings outlooks (hence the backward slopping scatter plot). 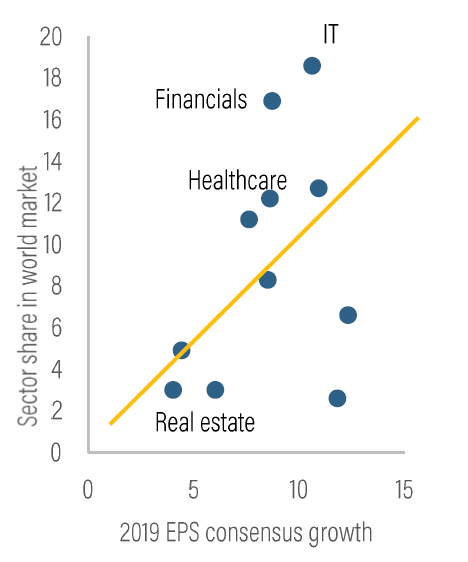 In contrast, global sector weightings are biased toward sectors with faster growing earnings (such as IT, financials and consumer discretionary). The Australian market has been benefiting from its significant exposure to materials, a sector that typically performs well late cycle. China’s growth has also proved more resilient, with its focus on ‘greener growth’ imparting an unexpected quality bias to Australia’s commodity demand. The Australian dollar’s decline through H1 2018, from around USD 0.81 to USD 0.74, has also supported domestic companies with global earnings. Indeed, the equity market has rallied to a 10-year high through June (led also by some reversal in recent bank sector weakness). But the market’s high exposure to ‘bond proxies’ - sectors that have benefitted from the multi-decade trend lower in bond yields - leaves Australia vulnerable to the likely ongoing rise in global interest rates, as the Fed continues to remove liquidity over the next couple of years. This includes defensive sectors, such as real estate, telcos, infrastructure and utilities. Further, the recent tightening of lending standards by the regulator has raised the risk of a sharp reduction in credit availability. Given Australia’s past dependence for growth momentum on housing activity (where price and lending growth is now slowing), alongside an increased gearing of household balance sheets, this is likely to be a headwind to achieving the above-trend growth in Australia, that we are now seeing in Europe and the US. Long-term risk and return expectations for each asset class, as well as correlations between asset classes, are used to build strategic asset allocations (SAAs) that are expected to maximise risk-adjusted returns. The risk and return profiles of an individual investor can then be matched with an appropriate SAA. The return typically reflects an assessment of the outlook over the coming few years, including the specific point in the asset and economic cycle. For example, return expectations for domestic and international government bonds have been rising over the past decade, as yields on bonds continued to surprise lower, relative to long-term history. Blackrock, which is one of the sources we use to form our long-term risk and return expectations (capital market assumptions), has recently updated its estimates. Interestingly, it has significantly increased the expected outperformance of international over domestic equities. In particular, the assumption for international equities has remained at 6.8% per year, while the expected return for domestic has been reduced from 6.3% to 5.9%. This has almost doubled the expected annual outperformance of international equities relative to domestic from 0.5% to 0.9%. At the same time, domestic equities are expected to be more volatile than international equities, presenting Australia as a moderately higher-risk, lower-return, market. Notwithstanding our assessment that the cycle is maturing, or that we’re even late cycle, we maintain our tactical preference for equities over bonds. While global growth may be becoming ‘less synchronised’, as the US increasingly takes the lead, European and Japanese growth remains well above prior averages, supporting growth and earnings momentum, and eventually rising inflation. ‘square our bets’ on our international equities overweight by moving overweight the US and balancing our exposure to Europe, where growth risks have risen. For credit, Société Générale recently noted that “leverage has increased in both the US and Europe, debt growth has been outpacing GDP…a combination of higher global yields and slower growth should put even more pressure on credit spreads toward 2H18”. Emerging markets are also facing rising financing costs for corporates as central banks raise rates to defend weakening exchange rates and inflation targets. Credit appears more vulnerable than government bonds, where central banks may well be more sensitive to a weakening credit environment, as the world exits this grand decade-long quantitative easing (QE) experiment. For equities, the prospect of a further rise in bond yields remains front and centre, especially to the extent it supports a stronger US dollar and hampers growth in emerging markets. We remain neutral emerging market equities, favouring Asia ex-Japan, where sector exposure (technology) and fast population growth merits allocation. With renewed uncertainty over Brexit and rising political instability in Prime Minister May’s government, we drift further underweight the UK after a strong quarter for equity returns. For Australia, we also move further underweight as the market has recently reached a 10-year high, despite a modest earnings outlook. Our decision to remain overweight Europe reflects the economy’s less mature cycle and a now more dovish European Central Bank (ECB) flagging near-zero rates until late 2019. Valuations are also relatively undemanding. But Europe’s Q2 2018 growth rebound was well short of that for the US, leading UBS to trim its 2018 growth forecast from 2.5% to 2.2%. US growth is on track to rebound near 4% in Q2 2018 and UBS analysts have lifted their S&P500 earnings estimates, with the P/E now 16.1 and ‘’back near 2016 lows”. We are choosing to ‘share’ our international overweight between the US and Europe. Of course, the tightening of US monetary policy is also flattening the US yield curve, causing angst that the growth cycle is about to end. However, as BCA research highlights, “since the mid-1950s, every US recession has been preceded with curve inversion. The lead time, however, varies from one month to 18 months.” Given the vagaries of this signal, it is more likely to be the extent inflation and US Treasury yields rise from here that will determine whether we exit 2018 tactically overweight international equities. We are not bearish Australian growth, nor domestic equities. But we continue to view international equity markets as warranting a relative overweight, in part due to their higher sector weightings in structurally faster-growing sectors and in part due to expected above-average economic growth. Consensus continues to favour the Australian dollar rising back to USD 0.77. But our sense is that the Australian dollar is more likely to trend lower, commodity prices have likely peaked, China’s growth is expected to slow in H2 2018, and the Reserve Bank of Australia (RBA) will be out-hiked by the Fed this year. This also favours unhedged international equity positions.